The global Ebola-X pandemic of 2022 lasted five months, two weeks, and six days before a cure could be found. In its wake, it left a generation of psionic freaks, who can turn a single thought into a weapon…or worse. 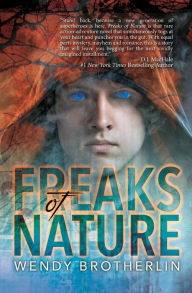 Fifteen-year-old Devon McWilliams is one of those freaks, but Devon rates a big fat zero on the scale of cool psychic abilities. Days after escaping from his psionic detainment facility, the military intercepts him. Regaining consciousness, Devon finds himself restrained aboard a military airship headed toward certain death. Aboard this one-way flight to doom are six other psions. One of them, a telepath named Bai Lee Chen, claims to have the means to escape. All the others have to do is convince her that they’re worthy of freedom by allowing her to telepathically replay their memories. The last thing Devon wants to do is reveal his useless plant-talking prowess to this destroy-you-with-a-thought crew. To complicate matters further, he’s crushing hard on Alya, the group’s lovely healer. Devon knows he must keep his wits about him if he’s going to survive this wild ride. And that’s going to be a tricky thing to do around a telepath who seems to have a diabolical agenda all her own.